A UN survey has found that the illegal cultivation and a rising demand for hard drugs like opium and heroin is pulling Afghanistan apart, continuing to plague an already fragile nation. Afghanistan remains the world's biggest opium producer, and on the frontline of the war on drugs are the police which have their own demons to contend with. Former army commander Abdul Rahim used to put people behind bars for doing drugs, but now he has been put there himself. Rahim denies the charges; he insists he never swayed from the right side of the law. “We saw a truck driving on the main road. Something made me suspicious and I checked out the cargo. We found narcotics, heroin and some drugs,” the former Afghan army commander said. However, what Rahim claims he did not expect to find was a driver who told authorities he was involved in drug smuggling. Abdul’s cell is guarded by another policeman, Esmat Ullah. He has been taking drugs since he was twelve and went for treatment only recently after the prison warden found out. He is in good company: according to a recent US Congress report, nearly half the Afghan police are doing drugs. Pul-e-Charkhi is Afghanistan’s biggest jail and many of the 5,000 prisoners there are doing time for drug smuggling and/or drug use. Inside these four walls is a snapshot of the problems facing Afghanistan society: Taliban members, drug traffickers and petty criminals – and they are running out of space. Unfortunately, the locks are not a sure safe way of keeping the drugs out of this prison. The Commander of Pol-E-Charkhi Jail Major-General Abdul Baaqi has quite a collection of the different kinds of drugs he confiscated inside his facility over the past years, mostly opium. Over the years prison guards have been charged with lending a hand. “Yes, it is true, when I joined a few years ago, lots of guards were involved in smuggling drugs into the jail,” remembers Major-General Abdul Baaqi. “They are not very well educated and they do not have enough of a salary,” explained Raz Mohammad Dalili, Executive Director of Sanayee Development Organization. “They are not joining the police to serve the people, they are joining the police to serve themselves,” he admitted. The Ministry of Counter Narcotics insists it has now got a hold on the problem. “Before a police [man] can become a police [officer] he gets tested; he will have certain tests before going through the exercise or becoming a police sergeant. This is something that has been developed on the army level,” shared Zulmay Afzali, Spokesman at Ministry Of Counter Narcotics. Yet questions remain: what if some of those fighting Afghanistan’s drug war are actually foot soldiers for the other side? With the many challenges the country faces, does it really have the resources to tackle the corruption within its ranks? At the same time, the spokesperson for the Afghan Counter-Narcotics Ministry in Kabul claims the poppy production in Afghanistan has been slashed by 48% compared to the previous year, so the opium prices have tripled. “Unfortunately, countries like Russia and the Central Asian republics – their seizure rate is only 4-5%. In Afghanistan we have a greater seizure rate, more prosecutions. I should say this is an international, not a regional issue,” he stated. Former White House drug policy spokesman Robert Weiner says the drug problem can only be solved by eradicating poppy crops altogether. And this is also a way to fight terrorism. “The only way you can cut off money from the Taliban and Al Qaeda – because drugs are 70 percent of their funding – is to eradicate the drugs out, the source of their money. And they will – to that proportion – disappear,” Weiner said. “But the eradication must be combined with what Hillary Clinton is proposing, which is crops substitution. Those two policies combined – eradication and crops substitution can be a solution,” he added. 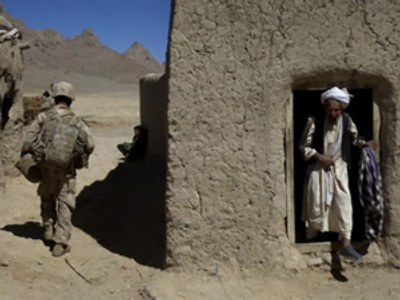 Igor Khokhlov from the Institute of World Economy and International relations considers that the overall situation in Afghanistan has spiraled out of control to such an extent that drugs are simply not a priority now for the US forces and their allies in the country.